Fiesta! 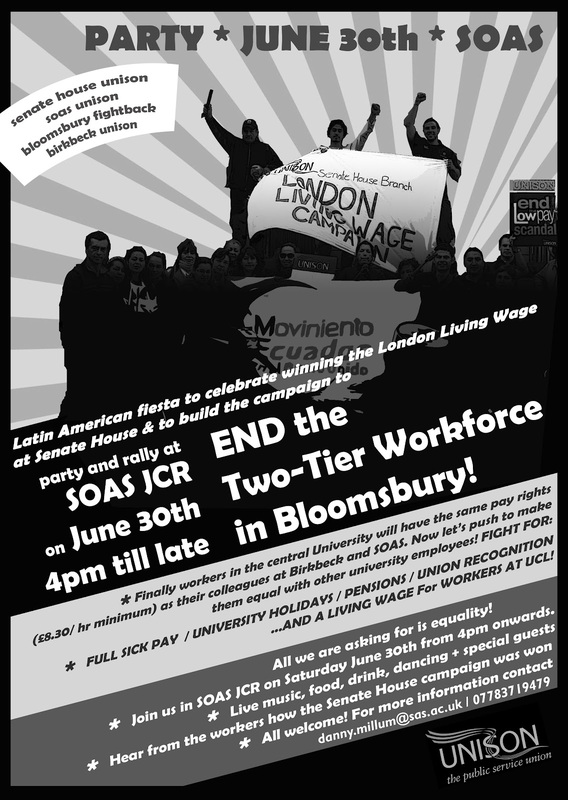 June 30th, SOAS: End the Two-Tier Workforce in Bloomsbury! | Bloomsbury Fightback! Senate House Unison, Birkbeck Unison, SOAS Unison and Bloomsbury Fightback! invite you to join us to mark our victory in the London Living Wage campaign at Senate House, which we are celebrating with a Latin American Fiesta! Where: SOAS Junior Common Room, Thornhaugh Street, Russell Square, London WC1H 0XG. What: Food, drink, Latin American music, a live band and the bare minimum of speeches. Who: Everyone– crèche facilities will be available.